Multiway boulevards offer an appealing alternative to congested arterials in metropolitan areas. These streets, which are common in Europe, really are "mixed-use" public ways. They have several lanes of faster moving through traffic in the middle separated by medians from slower "access lanes" and parking on the sides. Local traffic and bicyclists travel in the side lanes, which allow for safer travel and easier access in and out of driveways and side streets than on a typical arterial. Generous numbers of large canopy trees on the medians and lining the sidewalks create an attractive streetscape. The sidewalk, access lane and its median together become a "pedestrian realm" that buffer walkers from the faster roadway. Image of Eugene's Franklin Boulevard as it might look in the future as a multiway boulevard. Allan Jacobs and Elizabeth Macdonald, co-authors of The Boulevard Book: History, Evolution, Design of Multiway Boulevards, emphasize that good urban design begins with good street design. On a multiway boulevard, ground level retail shops can take advantage of on-street parking in the access lanes. Residential and commercial uses are attracted to the park-like quality of the landscaped boulevards. Unlike conventional arterials and freeways which divide and deaden neighborhoods, multiway boulevards support a vibrant street life and help create livable neighborhoods. 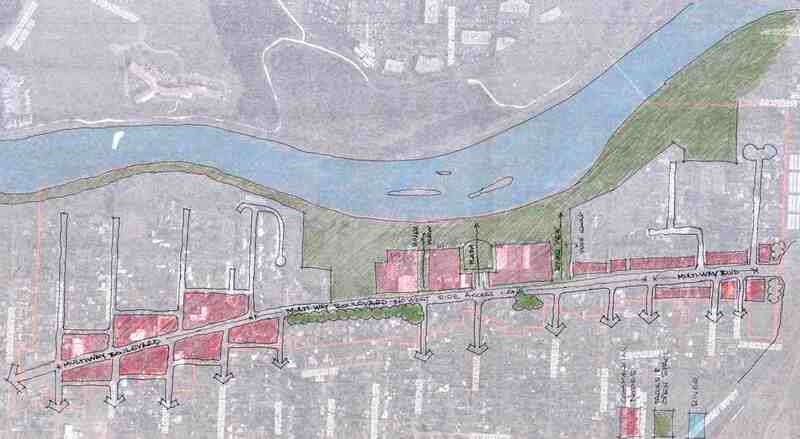 A Multiway Boulevard for River Road? The River Road right-of-way is approximately 100 feet wide through the Study Area. This is narrow for a full multiway boulevard, but with some creativity and flexibility in design, the concept holds much promise. Mark Gillem proposes a full multiway boulevard (with access lanes on both sides) through the southern (Thomason-Briarcliff) and northern (Stults-Hilliard) commercial areas where there is existing commercial development on both sides of the Road. He proposes just one access lane along the east side of the road through the central commercial area (Briarcliff-Stults). Access lanes are unnecessary on the west (residential) side of the street in this area, and this configuration would allow preservation of existing heritage fir trees between Knoop and Park Avenues. Much of the property adjacent to River Road within commercial areas is paved parking at present. If sidewalks were moved over a few feet, this would allow existing sidewalk and paved parking areas to be reconfigured to serve as a local access lane with on-street parking. What about bus rapid transit (BRT)? In local transportation plans, River Road is slated for a BRT line 25 or 30 years from now. Could River Road accommodate BRT if it were reconfigured as a multiway boulevard? Does BRT need a full dedicated lane, or could it function with dedicated pullouts? Or, will BRT be the right choice for River Road at all by the time 2030 rolls around? It is too far in the future to foresee what changes might have occurred to Americans' driving habits due to global warming, dwindling petroleum supplies and escalating gas prices, but certainly the changes may be significant. By then, auto use may have been reduced such that the road can support a street car or light rail. Details of how to accommodate BRT should not prevent other modifications to improve River Road in the meantime. • Octavia Boulevard: The Design. This City of San Francisco web site describes the characteristics of Octavia Blvd.--the central traffic realm, pedestrian realms, lane widths, sidewalks, traffic controls, etc.--along with drawings. Mark Gillem Op-Ed in the Register Guard explains how turning Eugene's Franklin Boulevard into a multi-way boulevard will make it safer, more attractive, and "a place instead of a place to drive through".